We met the team at IS Projects during a FAT Village Art Walk event and immediately became close friends. 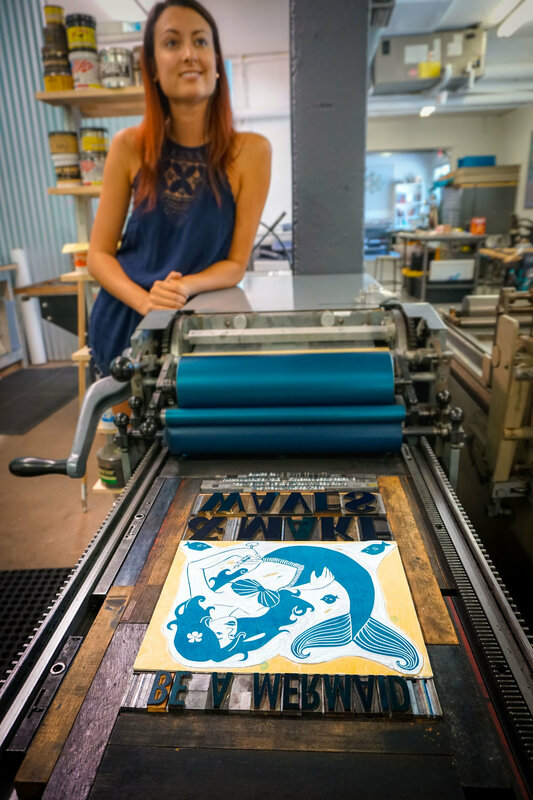 A collaborative printmaking and book arts studio, IS Projects is built on collaborations. After realizing our shared passion for the ocean, we joined forces and created a limited edition hand-printed art poster to benefit the local surf community in Cuba. Selecting the poster font. We wanted a font that would evoke the feeling of Old Havana - elegant and bold. "Be a mermaid, & make waves"
Being that the proceeds from this poster was going to benefit the local women's surf community in Cuba, we had to reference mermaids! We chose teal and yellow as background colors for the poster. 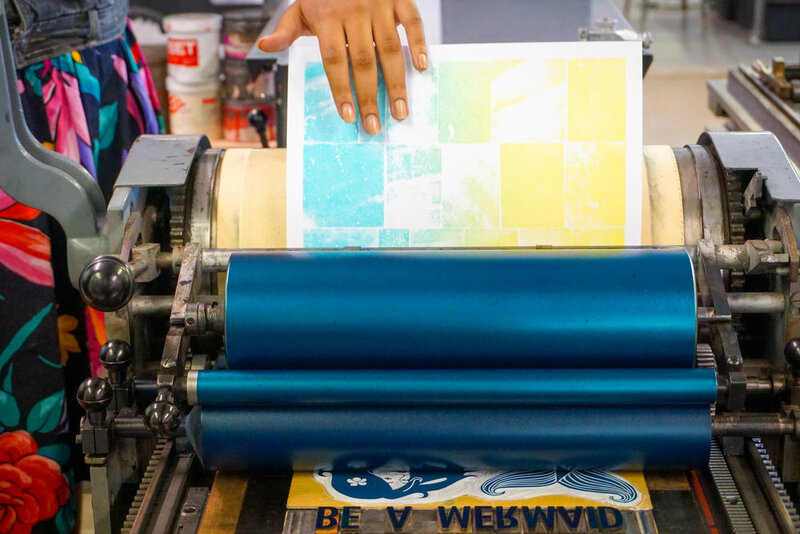 Not only are these the colors of our brand, Ola'pi Creative, when pressed together during printmaking, they evoke the same look of the sun's rays shining through the water. 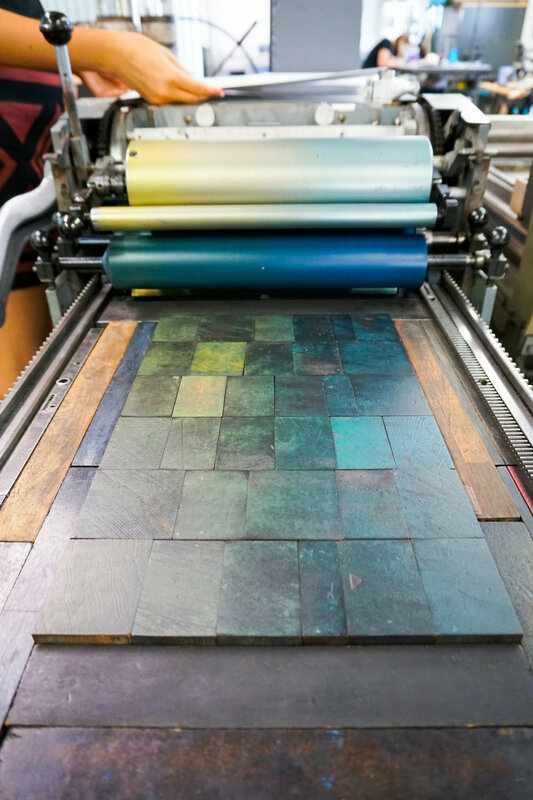 Block printing literally uses wooden blocks to imprint a light texture onto the paper. The great thing about hand printing is that each piece holds different color variations making each print unique. Ingrid is not only a master printmaker, she's also pretty great illustrator. She drew and carved out the mermaid for our poster. Of course no mermaid is complete without her fishy friends! Once the background block pattern was dry, we set the press for the next layer of font blocks and linoleum design. The finished product, a 11" x 14" limited edition mermaid poster. Not only did this creative collaboration bring together 2 creative agencies, it created a bridge between communities of water people in the US and Cuba. with a portion of the proceeds going to support the local surf community in Cuba. Send us a message and let's work with purpose to create something meaningful!